A few years ago, I started using my freezer for more than just storing ice cubes, and not to sound dramatic or anything, but it has changed my life. Did you know that you can freeze almost anything and it thaws out just a good as it was originally? Maybe you knew that, but I didn’t, and I’m slightly obsessed with freezing things now. 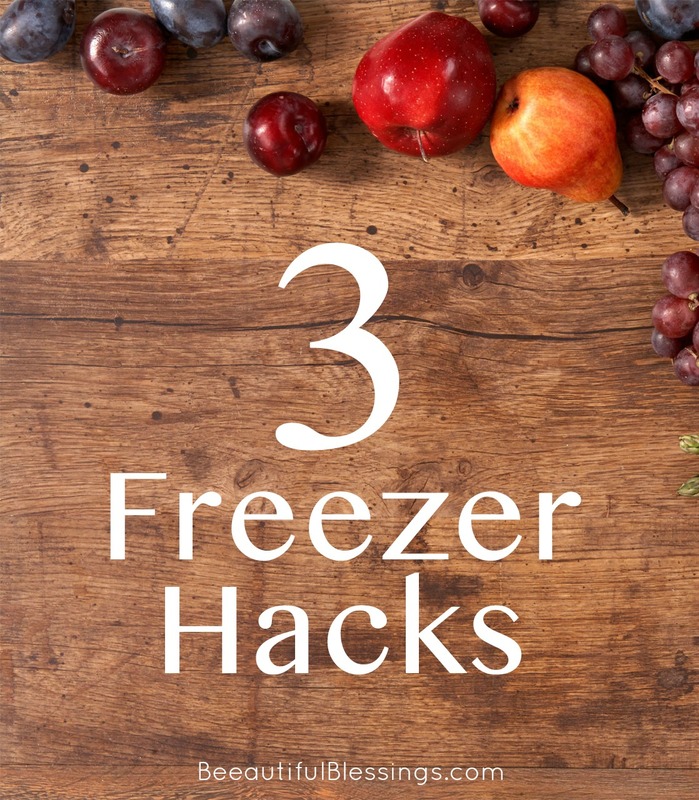 Here are 3 freezer hacks I have discovered over the past few years that make all the difference in my meal planning. Since Kaity is about to have another newborn on her hands, I thought this might be useful to her and to her readers! I don’t know about you, but sometimes I want to make a quick skillet meal or casserole, and the first step is to brown and drain a pound of ground beef. The recipe itself might not take very long, but this step alone takes 15-20 minutes when all is said and done. What’s a cook to do? Here’s my trick: brown and drain 5-6 pounds of ground beef at once and freeze the cooked meat in 1-quart freezer bags in 1- or 2-pound portions. When you are ready to cook and need a pound of cooked ground beef, just run the bag of frozen meat until hot water to loosen, dump it into a hot skillet, and heat it up! Yes, it is annoying to spend an hour cooking 6 pounds of ground beef, but it is so worth it for later when you have it handy in your freezer. The same principal applies here as with the ground beef. I have a few recipes that call for one or two cups of chopped, cooked chicken—pot pie, skillet chicken and rice, even as part of a salad or adding to pasta. But messing with raw chicken is no fun and takes a long time. Here’s what I do: I cook 4-6 boneless, skinless chicken breasts in the CrockPot for 4-6 hours on low with some chicken broth and spices. When it’s done, shred the chicken and freeze it in 2-cup portions in 1-quart freezer bags. The next time you need chopped, cooked chicken, just pull a bag out of your freezer! So easy! As a full-time working mom, it’s always a rush to get out the door in the morning after packing my breakfast to eat at work and packing a breakfast for my daughter to eat at daycare. But I have found a brilliant solution: spend an evening making a few batches of muffins or bread and freeze it! Here are two great recipes I have found that are kid friendly and taste great: carrot oatmeal greek yogurt muffins and sweet potato muffins. Freeze the muffins in a gallon-sized freezer bag, and then all you need to do is pull one out of the freezer in the morning and go! By the time you are ready to eat, the muffin will have thawed nicely (you could also take it out of the freezer the night before if you wanted, but I don't always think that far ahead). I have also made healthy banana or zucchini bread (I find recipes without a lot of sugar!). Wait for the bread to cool, then cut it into thick slices and freeze. Then you can just grab a slice of bread and be on your way. Isn’t that awesome? Making things ahead of time isn’t always fun, but it saves the day when I am in a pinch and need something delicious to eat. I hope this has been helpful for you! Feel free to visit my blog and search my recipe tab to see my favorite meals. Thanks to Kaity for having me guest post. Feel free to come over and say hi! I blog at: http://www.theladyokieblog.com or you can find me on Twitter @theladyokie. What is your favorite thing to freeze? Do you have a great kid-friendly muffin recipe I should try? Please share!